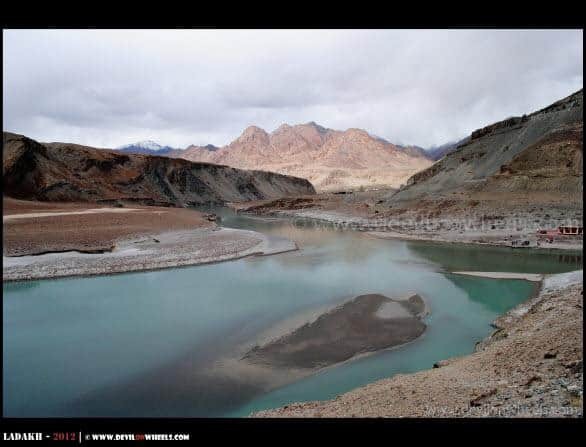 We had come to the closure of the trip being the last day before we flew back to our homes next day by morning flight after an adventure filled journey over past 5 days within Ladakh. 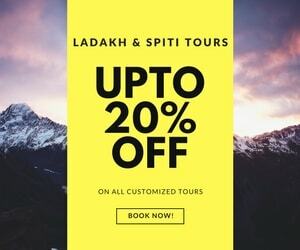 The feeling was amazing, nothing would have worked out better than this trip which had everything – beautiful vistas, adventurous roads, tonnes of snow, sacred / holy places, spiritual time, remote Himalayan terrain, scary experiences, lovely weather and what not… Everything one could expect from a trip!! Still, we were thinking “Everything? ?” 😀 … Probably not!! 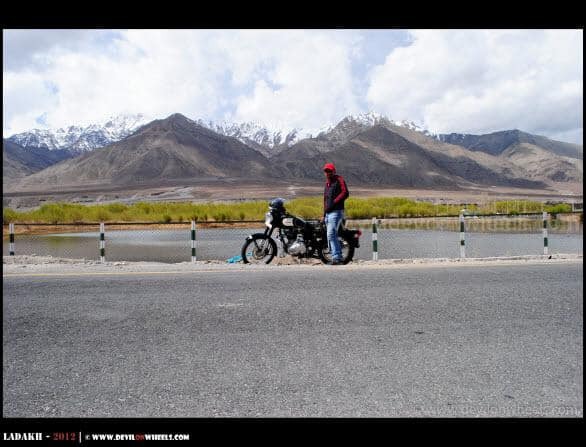 A Bike Ride would be perfect end to this trip, so we got up early yet again and went to our favourite Lamayuru Restaurant at Leh for the breakfast and then got the bikes from Apex Tours and Adventures for Rs 800 and Rs 1000 with 5 Ltrs of Petrol. We decided to have a bike ride to Chilling + Sham Valley and then later half of the day we decided to spend in the market shopping for the loved ones. 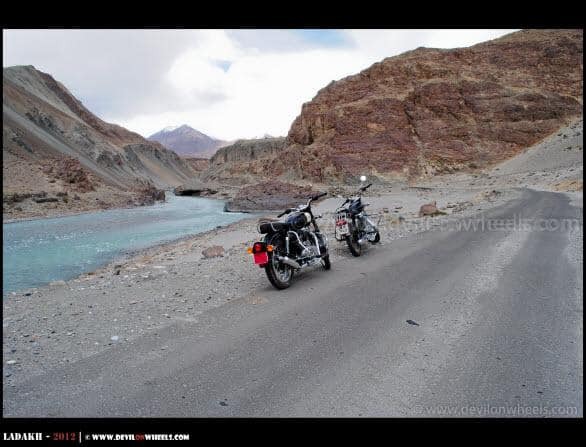 Take Your Way… River or Road??? 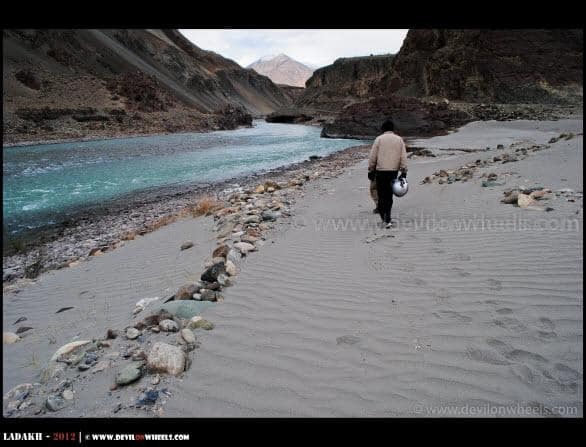 On the way back, just before the confluence we decided to spend sometime on the banks of Zanskar River, so parked our bikes aside and went on the shores. 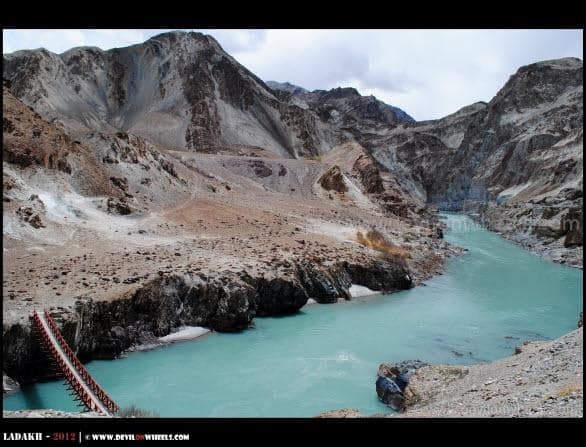 It was so magical, the sound of water, the color of water and magnificent scenery of hills behind overlooking Nimmu Village, a feeling that brings a smile to my face even now as I write this. We decided to have lunch at Nimmu Village and headed there because we wanted to go ahead of Basgo Plains to click some pictures while riding on that famous straight road that looks like a runway to heaven… On the way we saw that Ad Film group had come to confluence to shoot but this time we bypassed them without stopping. After a nice veg. chowmein and momos at a dhabha at Nimmu we moved towards Basgo Plains and reached that road where we wanted to click pictures. It was around 1 PM and we clicked alot of pictures. 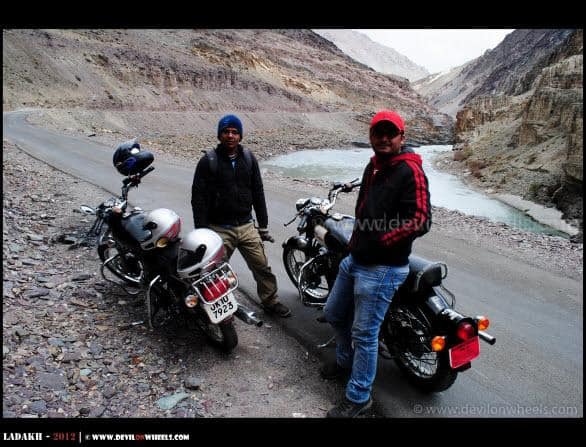 Even Tejas ride as well and felt the thump of the Enfield as well… After a nice time, it was time to head back to Leh as weather had turned overcast by now. 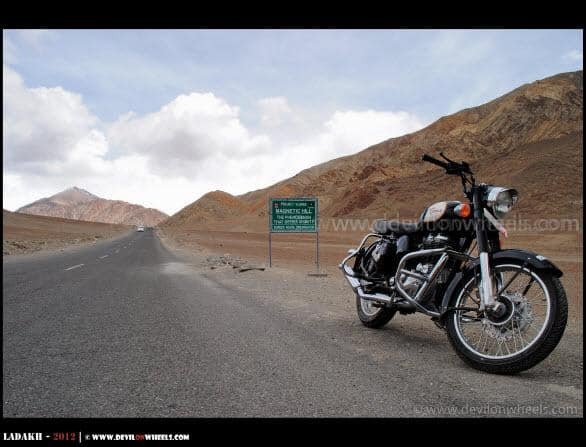 As we moved back, I had become confident to ride the bike around 50-60 KMPH and we had a smooth ride so far. 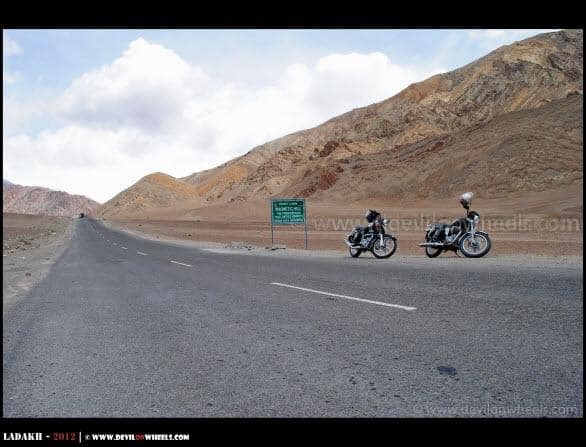 We crossed Magnetic Hills, Pather Sahib, Phyang and were nearing Leh. 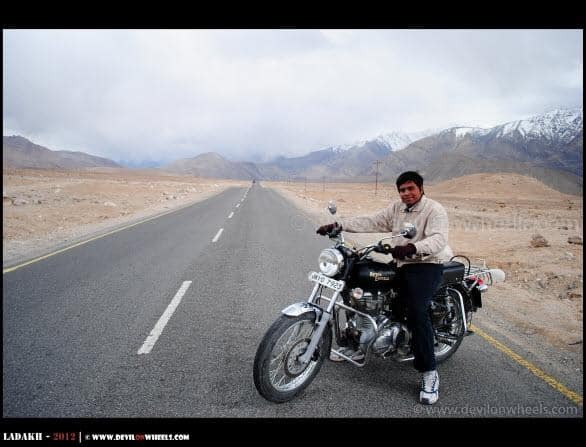 There were lots of diversions on the highway as construction work was going on and the sideways was a dirt track where I was riding at around 20 KPMH but it was faster than morning when I was almost at 10 KMPH. As we passed 4-5 of such diversions, I was pretty confident of the balance and may be a lapse in concentration as I saw a truck hurrying up towards that diversion. I decided to exit first so turned the accelerator a bit to exit that diversion before those trucks enter it only to find lots of sand and loose gravel on the road and when I applied breaks — BANG… The bike skidded, I put my feet to hold it, once, twice, but it was too late as I saw the vistas ahead go down my sight as we kissed the road with bike lying flat… Camera rolled over out of Tejas hand to the other side and we both were lying flat on road with bike on my feet. As I stood up, I carefully examined all my body parts by moving them – There was a little pain in Shoulder, some bruised knees and elbows but nothing serious… Same was the story with Tejas with little bruises on knees and elbows but as I had took the pressure twice on my foot, it saved us alot otherwise things could had been worse. 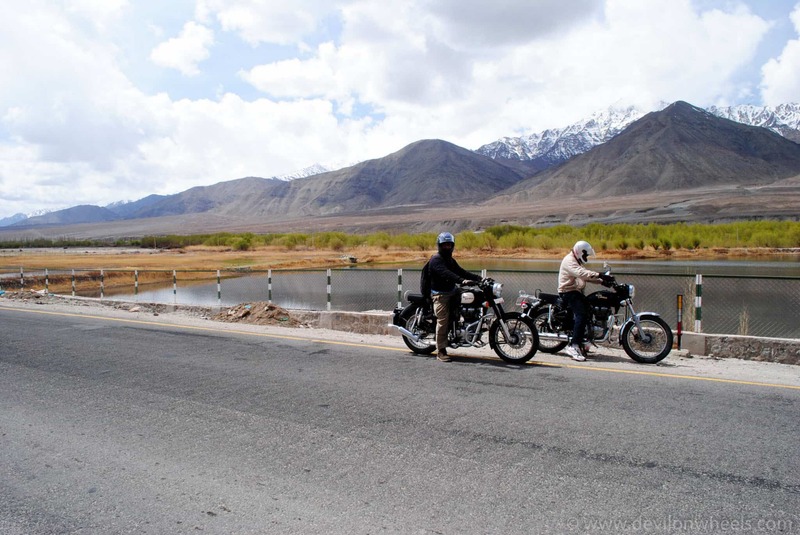 This was only the thing left to happen to end this trip 😀 … Well, I looked at the camera and its lens and everything was intact and there was a sigh of relief BUT tension as we had switched the bikes on return and it was new RE Classic that was lying on the road. An idiot tourist was filming it only to record some helping verbs from my side instead of lending a helping hand… Now, probably he could watch it with family muting those verbal 😉 … Bloody Jerk!! Meanwhile, Himanshu had also arrived from behind amidst all this mellow-drama. We picked up bike, checked it thoroughly and thankfully everything was intact except Leg guard had taken all the impact and proved much worthy. There was a headlight cover that had bended but that would not cost us a bomb and thankfully no major damage had been done to the bike as well being slow in speed!! We decided to rest for sometime as we moved with smiles out of the shop and then go for some shopping in the evening. It was very cold as it was snowing lightly in the evening when we walked out to shopping where we met Rigzin as well who was helping the other group to buy some local clothes and specialities. We exchanged few words with him, told him today’s story on which we had some jokes, asked him to be on time tomorrow morning for a drop to airport and finally after buying couple of things for my wife and mother, we went to Gesmo Restaurant for the dinner. After a delicious dinner at Gesmo, we went back to Paul Guest House, where we were putting up in Leh for a final night sleep at the heaven and lots of dreams of the trip!! 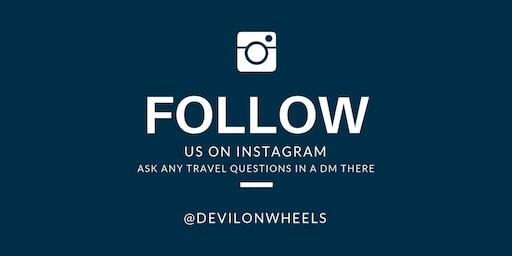 Anyways, this was really a great help to all those who are visiting Leh and surroundings. Hello again . . gud to see new forums but dont know where to ask . 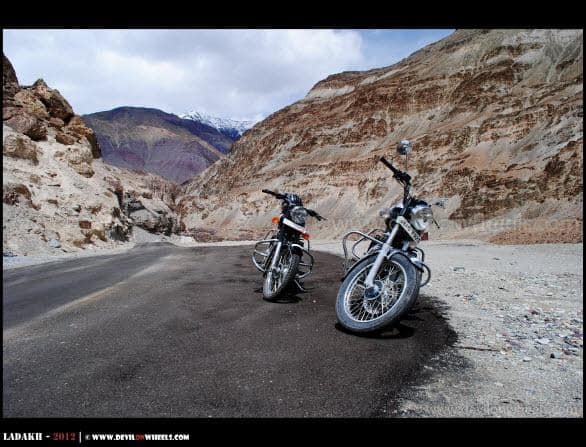 . . so my question is i m planning bike trip from sringar leh manali ambala . and i m trasporting my bike in train . 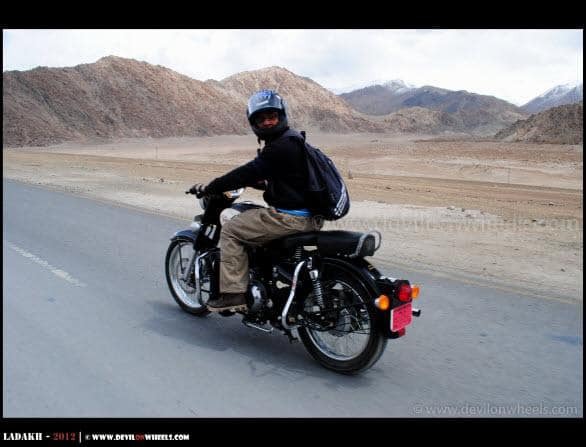 .so need help on that as well .. And it is an pulsar 180 and we are 2 of them so is it possible to do that with luggage . 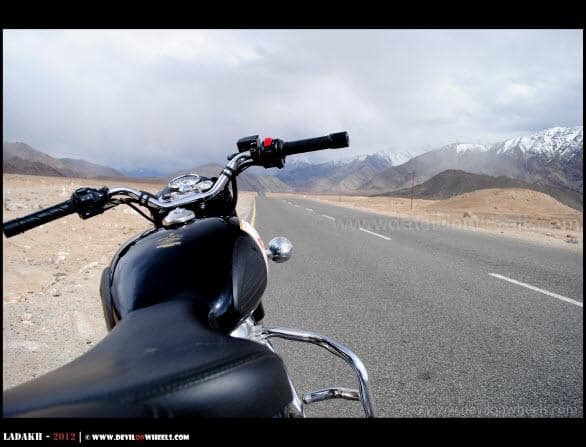 hhave more questions . . .but pls reply this atleast . . .thnks . .
do we get rented bikes in leh so that we can cover sham valley from leh on byk….and return back…. 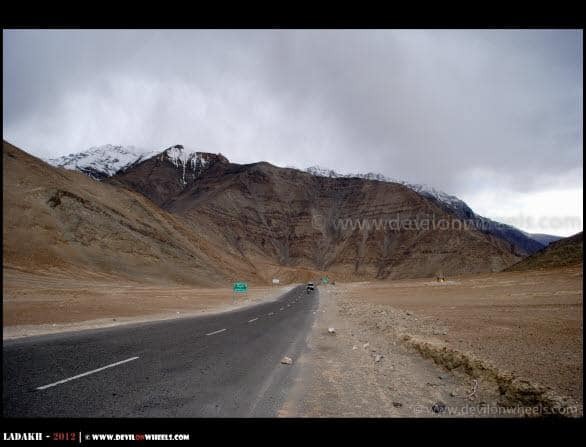 we vl be reaching leh by car or bus…so if you have any contact of byks on rent shop in leh..plz do share…. Yes, you can rent bikes in Leh and Fort Road in Leh is full of such shops that rent bikes. 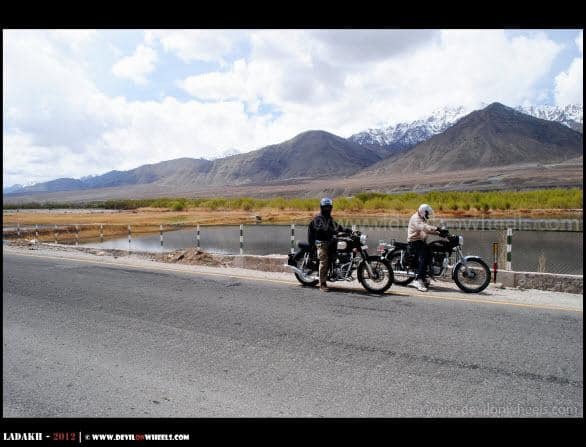 Depending upon the condition, model, make and tourist rush you can get bikes starting from Rs 600 to Rs 1200. 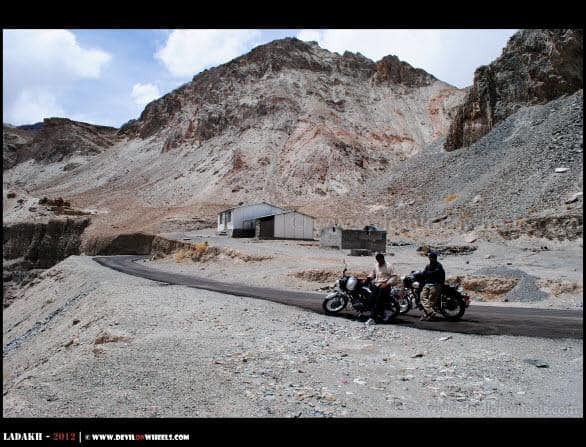 Rather than booking over phone, it is much better to visit the Fort road, check 4-5 shops over there and get a good deal after checking the bike conditions. 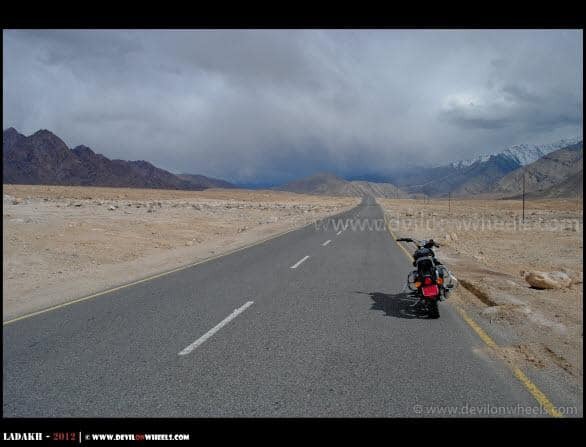 Thanks a ton dheeraj for your reply…now we have to select two places from three options Pangong(1 day), tsomori( night stay), nubra (night stay)..what according to you will be a good bet to visit in 1st week of may pangong + nubra or pangong+ tsomori…. 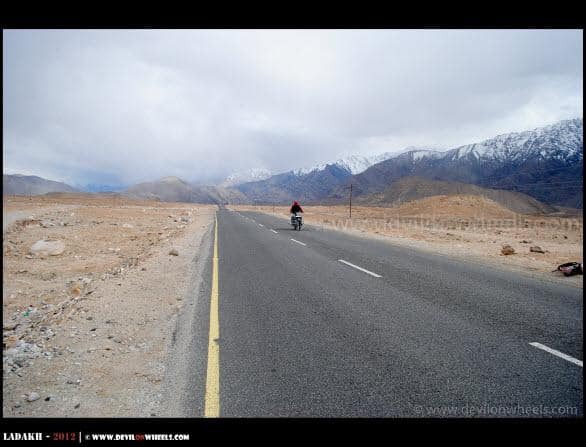 also if we plan to go tsomori…can we take bikes for a day and visit khadungla? 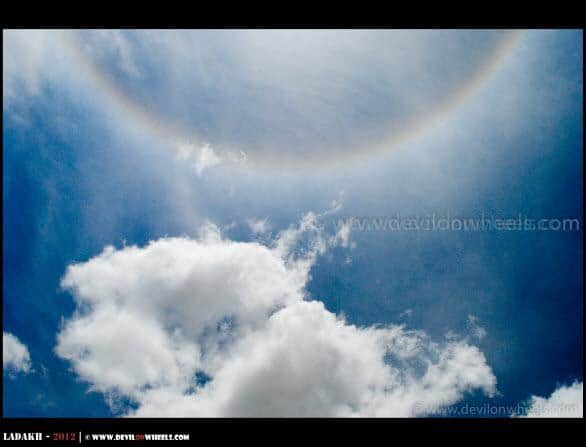 is it reccommended or do ppl go on byks at such high altitude? what else do you think we can cover on byks for a day…. awesome clicks bhai . .. u should b in hollywood . ! 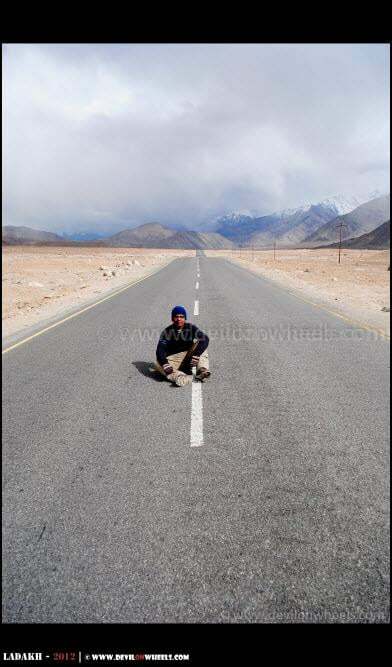 i just wanted to know that , as u metion tht the road from chilling goes to padum . . so how much time will it take and how is the road condition .? coz our iternery is like . .
so if there is a road between it will really save a lot of time . . .but could not possible without your help. . 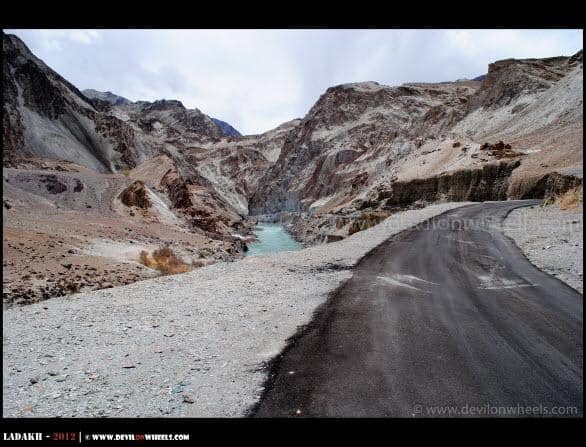 Yes, you cannot drive from Padum to Chilling as of now this route is done over foot over the Zanskar river once it gets frozen in winters and popularly known as Chadar Trek. 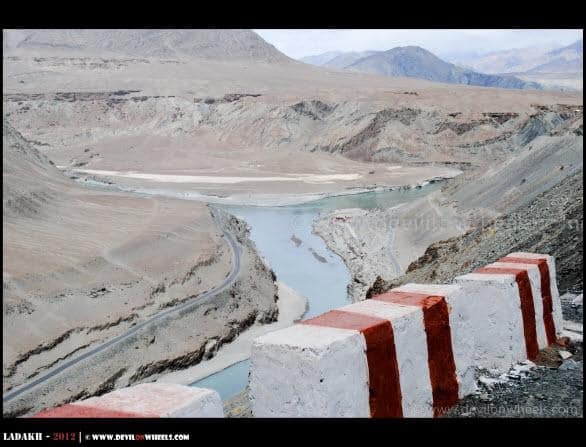 Once the road will be constructed or perhaps will be through, then it would be possible to drive along side Zanskar river all the way from Padum to Chilling to Leh. Hi Dheeraj interesting narrative. 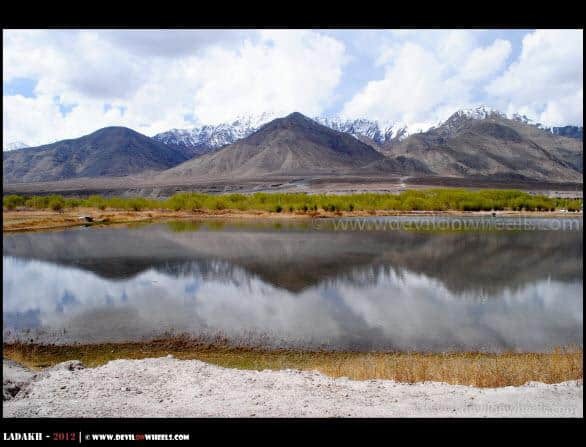 I did a bike trip to Nubra in first half of June this year. There was a lot of snow. Do you have any idea how was it in July and how is it now? 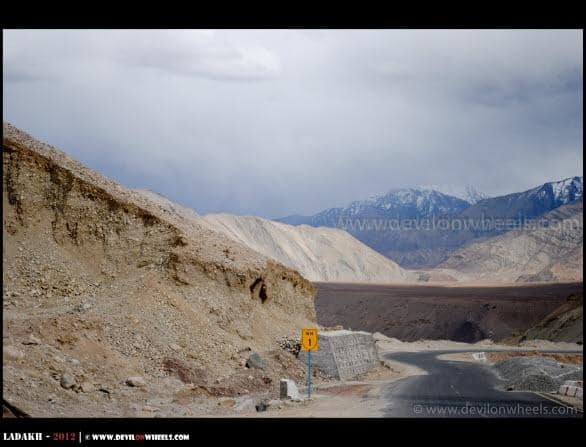 Usually the snow around Khardung La goes away by mid of July aside of roads and by June end it goes away from the road. 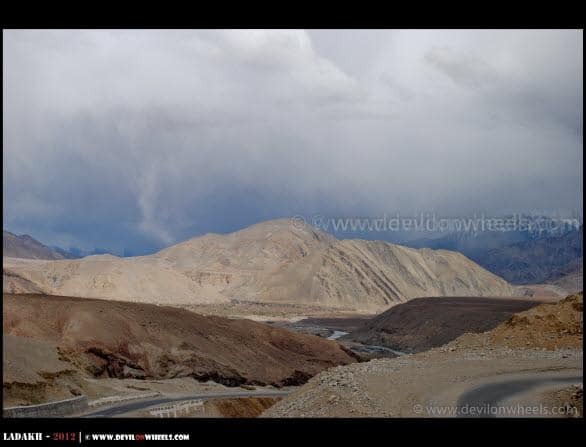 Right now all snow would have gone away and you see some great autumn colors of Ladakh. As usual, lovely pictures, and experiences. Thanks God for small bruises and the only small tension of spoiling someone’s vehicle. Very interesting narrative. Looking forward to the next one.:-)Thanks. Thank you Sandeep bhai!! Yes, shayad is board ka Rang badal diya hai but white wala board abhi bhi hai wahan, vo doosri side par hai. 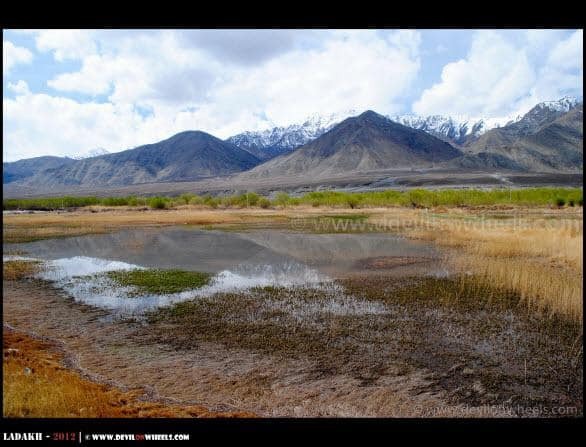 hi dheeraj great pictures of sham vally you visited this place in four wheeler and two wheeler which one is more exiting.by the way great blog.. Thanks alot Harshad !! Yes, definitely the bike ride has its own charm and I loved it to the core but like you read I just crashed it even on such simple roads so might not be my taste for future being so poor in riding 😀 … Yes, I did like the ride as compared to be sitting inside the car.